I suggested that a lesson plan that incorporates film is easy to prepare in advance, so I organized the following links that teachers can use to prepare a substitute lesson that incorporates film. The substitute teacher may have students who think they have the “day off”, but a film lesson organized with a written reflection can be an effective way to promote new learning. Film lessons are popular with substitute teachers. They are usually engaging, and they are easy to implement as long as the substitute can access the video online or operate the hardware to run a hard copy of the video. Our school has a subscription to Discovery Education which is jammed packed with digital content: film clips and prepared lesson plans are available for every grade level. However, other school systems may not have this resource. The following free websites were reviewed in the presentation for teachers to use in order to find videos, lesson plans to use with videos, and/or worksheets that can be completed by students watching videos. One major source to start looking for all video materials is the updated Edudemic 100 Video Sites on the Edudemic.com website.This website is organized with sub-headings General; Teacher Training; Science Math & Technology; History, Arts and Social Sciences; Lesson Planning; Video Tools and true to its name there are 100 sites, each rich with links to videos of all lengths in all subjects. Integrate Film in the Classroom: A quick overview to integrating film in the classroom. Video documentaries are also popular; since these are often shorter than a feature length film, many can be run during one block period. A note of caution: several of these videos will need to be vetted to assure content appropriate materials are used. Many of the video clips on these sites are current and can be associated with news articles to use to supplement the viewing as a comparison or a contrast. The Oscars.com website offers a generic documentary worksheet. This prepared sheet is organized around political discourse, but the sheet has questions that can be used with any documentary. The Ted Talks website describes the numerous video presentations as “Ideas Worth Spreading.” TED began in 1984 as a “conference bringing together people from three worlds: Technology, Entertainment, Design.” There are very entertaining videos on every subject, but most recently, there has been a new category devoted to education TED-ED. These short film clips at http://ed.ted.com/ are offered with interactive quizzes and writing prompts. My Film and Literature class used many of the lessons off the Film English blog devoted to film and English Language Learners (ELL) http://film-english.com/. The lesson plans are very detailed and involve critical thinking skills that can be used outside of the ELL classroom as well. Our English Department has been phasing out the department’s DVD library; so many DVDs were scratched or went missing during the school year. We now use commercial “instant streaming” websites where we can purchase videos for safekeeping “in the cloud”. Unfortunately, this means that one of the best features used for showing a film, the closed-captioning feature, is not available. If we cannot locate a film through an “instant streaming” service, we check with OpenCulture.com http://www.openculture.com/freemoviesonline which has hundreds of movies available. Some are subtitled in English; most are classic films. Suppose the DVD case is empty? Teachers can check here to see if the film is available for free on this site. Finally, the “motherlode” of film lesson plans is on the NYTimes Learning Network website. This is a one stop shopping for plans website (no subscription required) with lessons written by “[freelance] educators with deep and broad experience in the classroom and in curriculum development. They work with the editors, Katherine Schulten and Holly Ojalvo, who are also longtime educators, to develop the lessons.” The lessons are thorough, tied to standards, and so easy to follow that a sick teacher need only browse for a few minutes to find a lesson, film or otherwise, that can connect to a discipline. This year, the 80 minute time block is new for our school and for our substitutes, and this longer class period demands even more attention to preparation. No teacher or administrator wants to lose 80 minutes (X) times the number of students in the classroom; do the math- 20 students in a class X 80 mins = 1600 educable minutes! A film/video lesson should not be offered as babysitting, but rather a lesson that extends learning in another medium. 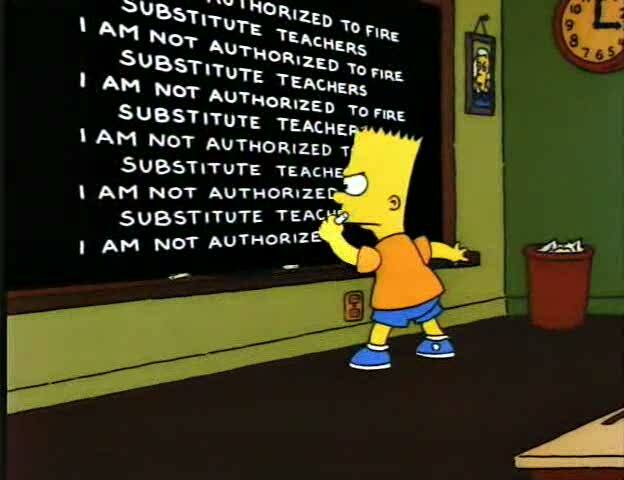 This quick presentation of information was designed to help teachers design lessons that can be easily implemented by a substitute teacher and meaningful for the students. A well-designed film lesson can be effective even if the classroom teacher is not the one clicking the “play” button.